Posted on 07/08/2016 What is a Cumulative Work Injury in Iowa? There must be labels affixed to the chemicals that include information such as the address of the manufacturer, warnings and other pertinent details. In some cases, pictures or symbols may accompany warnings. Labels can be available in a second language; however, it is required that they be provided in English and are readable. Failure to ensure chemicals are properly labeled could lead to serious injuries. Employers also must make sure that workers are instructed and trained properly so that they know how to work safely with or near these chemicals. Anytime a new chemical hazard is introduced to the work area, additional training must be done. Due to the potential serious consequences of being exposed to or harmed by chemicals, it is vital that employers take the necessary steps to make sure their employees are safe. When there is a failure to do so, it could lead to legal action. Even if you were at fault for a chemical accident at work and are injured, you are eligible to receive Workers’ Compensation benefits. However, your employer may try to deny your benefits or otherwise stand in the way of what you are entitled to. This is when you may wish to contact aDes MoinesWorkers’ Compensation attorney. The best way to learn what your rights are and the options that are available is to contact the Workers' Compensation attorney team at Walker, Billingsley & Bair. Our attorneys know the importance of protecting your work injury claim from the get-go. 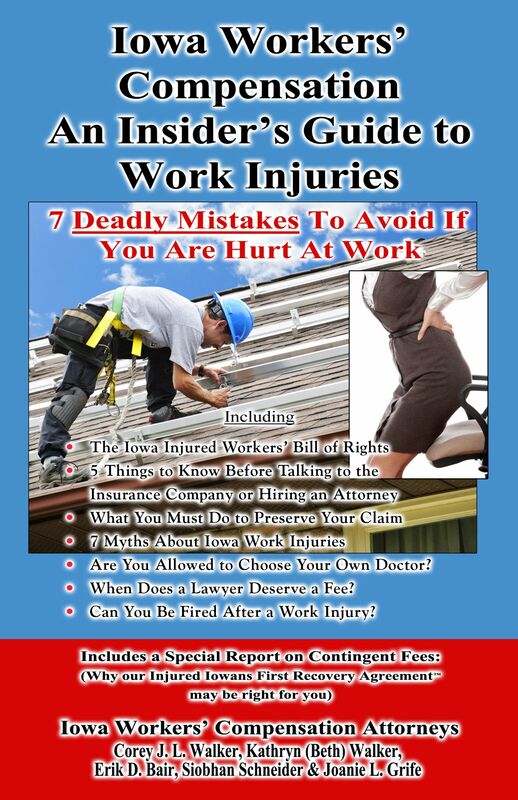 Learn more by ordering the FREE book, Iowa Workers ’ Compensation – An Insider’s Guide to Work Injuries: 7 Deadly Mistakes to Avoid If You Are Hurt at Work or by calling 1-800-707-2552. For immediate assistance or to schedule a consultation, call 1-(888) 435-9886.